So it’s increasingly looking like Austin, Texas, is going to be the second market for Google Fiber. Having yesterday sent out invitations to a bunch of reporters about a “very important announcement,” speculation quickly turned to Google Fiber, the one-gigabit service that is about 100 times faster than speeds available from almost any service provider — almost — in the U.S., along with pay TV service. Local TV station KVUE, an ABC affiliate, finally nailed down the story, citing sources in the city government. (See the video below.) And Engadget briefly spotted overnight an empty post on a Google blog with the headline “Google Fiber’s Next Stop: Austin, Texas,” which was quickly taken down. So that pretty much answers what the important “something” is. And it certainly makes sense. Austin is certainly the kind of mid-sized community that could benefit from the speed of Google Fiber. There are several tech companies either based in or with significant corporate presences there, including Dell, Apple and Samsung. But it’s probably going to be a long process before anyone in Austin has the superpipes installed at their house. If Google follows the same path it did in Kansas, it has to first get approval from local regulators to offer pay TV service. In Kansas City, that process started months before Google made its big announcement. Then it has to select local neighborhoods where it will build out the network. Again, if it follows the same process it did in Kansas City (notably on both sides of the Kansas-Missouri border), it will hold a competition, pushing different sections of town to campaign for the distinction of being among the first. In one case, the Colorado-based venture capitalist Brad Feld bought a house in a Google-Fiber ready neighborhood, and then held a contest, the prize being getting to live in the house. Once the neighborhoods have been selected, its a matter of waiting on the construction itself to get done, and that will take some time. Hint to Austin residents: Here’s a site you’re going to want to become familiar with: The Google Fiber status update dashboard, where you can either enter your address or click through on a map to see which parts of town are up and running. It’s worth noting that it’s been nearly nine months since the initial announcement in Kansas City, and as yet no installations are expected to begin before the fall of this year. 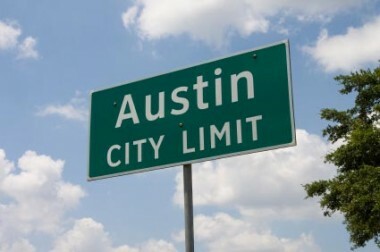 So, Austinites, be happy that you’re benefiting from Google’s big experiment. But be patient, because it’s probably going to take a while.